I just ordered one for my 14"...gunna run a SF P2X Fury with the single mode head (i.e.the Pat Rogers version). Will post pics ASAP, but will be a while as my 14" is still in "NFA jail". 1) You're going to love your SBS. 3) Take a look, I run a SBS BM4 a well. I loaded up a 6 series to the SBS to demonstrate something. On a standard BM4 you're barrel is the geometry you are normally dealing with on dual cell lights. With the SBS, the Mag Tube retainer is the larger geometric feature. The 6 series clears it at 1.25 bezel diameter, but I doubt the 1.37 bezel of the P2X will. It looks like the P2X / P3X will clear the barrel in CAD on a 18" Barrel, but even that I can't be sure until tested. I know you will like your mount, but I just want to make you aware of the SBS dynamic. I will be glad to exchange for the other ring if you decide to go that route at a later time, etc. Can you verify for me if the surefire fury tailcap can be held by the ring 100%, or if the body must be included in the clamping operation. I see no reason why not, it's a 1 inch body and tailcap. Forward clicky so the body does not need to freely rotate in the tailcap like the classic 6 series. Only issue is the 1.37" bezel diameter. It is not yet confirmed to clear the barrel. I have one on order and a few people inquired, I think one maybe testing soon. I wondered if the tail cap was long enough, mainly, to fully interface. It sure looks like it is. Thanks for the SBS pics! I bought my 14" last October and between the dealer to dealer xfer and then the Form 4, I still don't have it. Stamp should be here within 60 days. Really appreciate what you have done for the M4 enthusiast community! This light mount issue has been a huge thorn in our butts for a decade now, with really no decent solutions until now! Got mine today. Pretty sweet. - You can leave factory sling mount on it you wish with clip. If you do, no need to break gun down to install new mount. Reason I put this out there is you'd be surprised how many folks still just feed regular slings through them. Was at shop today with a couple of cops and they never seen QD mounts. Go figure. - Also, very tight clearance both close to the gun and hand guards. May limit some lights. I have a few lights here to screw with. Without naming them, what I find is: Short tail caps will not enable battery change. Also, if you do have a deep enough tail cap and only way to change batts is through it, break out your torx. When tightening down onto tail cap or vicinity depending on light, it will bow the housing of the light ever so slightly enough to keep cap from unscrewing. About the short clearance of the hand guards. If there 'were' a way to mount a light with a fat arse but had a 1" body per say, ng... I know this is not over sight. Just saying. But if it were mounted away from the gun just a tad, you could open your options to more lights. I have a Streamlight Polytech on order as it got great reviews for an inexpensive weapon light for rifles and shotties. Hopefully it will be ok. With everyone pitching in, maybe we can get a nice list of what will and will not work. Over all... I like it! It works for what I want. Now if someone only made a decent female QD button (behind receiver), mount for the m4 field stock, I'd be super happy. Hey Bhunted. Glad you got it! For the factory sling loop - SD mention it may not have to be removed, I had always assumed it did. By touch it feels a bit higher than the relevant constraining surface of the internal geometry of the cradle, see picture below. Not sure if there are different ODs on sling loops or if they are all the same. If it can be left on for all, that's great news. In either case, if one is motivated to use it, it can be surfaced in that spot to accommodate the light, worst case. Replacement factory loops aren't expensive. Let me know more details on your factory sling loop - is it possible your light is resting on it? Is it possible your OD is smaller? Tight Tolerances / Very little clearance - A subject I spent a lot of time on. I wanted a very high speed / low drag setup. Something yet completely unavailable to the market for M4s. You can do setups on ARs low pro all day. Benelli M4? Not a chance. This necessarily meant limiting your light options out of the gate. However, for those married to a specific light there are mounting options already on the market. For those that have been wanting lo-pro, I hope this does the job. That being said, I do have a 'ring' or 'clamp' designed that has a stub that wraps 350 some-odd degrees around a light and I can make one for any diameter body giving just about any specified amount of clearance for a bezel of X diameter. It would use the same mount, just a add on clamping device. I opted not to make it, this is a niche product serving a niche of a niche market. If the demand is there, eventually I could have a run cut. Field Stock - Is it hollow? How thick is the material where you'd want a QD? I have sunk Noveske and IWC flush mount QDs into a number of my firearms. PS90s, Steyr Augs, etc... I love flush QDs. Think you misunderstood the sling deal. I don't need the thread through sling attachment. Just that it could stay on... It was an observation because the cops I was explaining the magpul qd... he never seen one. He was using the cheap blackhawk cheapo thread through. I use QD.. The rest were observations as well. I wanted to point out the tightening would cause you not to be able to unscrew a light if you mounted it onto an end cap for instance. You also could not clear too much back to the hand guards unless the light was 1" straight back unlike other mounts where they could mount in the middle. As soon as a get a light solution I'm good with, I'll bring it over to the shop and hook you guys up as promised. Okedokee? And the Benelli M4 field stock... I have no idea how thick it is, hollow, strong, etc.... to put a stud in. I also don't want to hijack your thread. Just received my light and light mount (let my brother borrow my flashlight so who knows when I'll see it next). I am extremely impressed by AVA tactical's light mount. As you can see in the photos the 1.37" bezel is quite close to the barrel. I can slide a piece of paper folded twice in between the barrel and light. I have not fired it with the light attached so I'm not sure if the light and barrel would ever actually hit but it certainly fits. If they do touch under fire I'm sure a small shim piece would be all that's needed to bump it out from the barrel to provide more clearance. Anyway just got home and I need to play around with it some more. This mount is so worth it! Wow! I am excited to learn this. What exact model light is that? P2X? P3X? Also wanted to mention that I just had the tail cap under the clap so you could change out batteries without unscrewing the mount. I just received the AVAtactical mount for the Benelli M4. 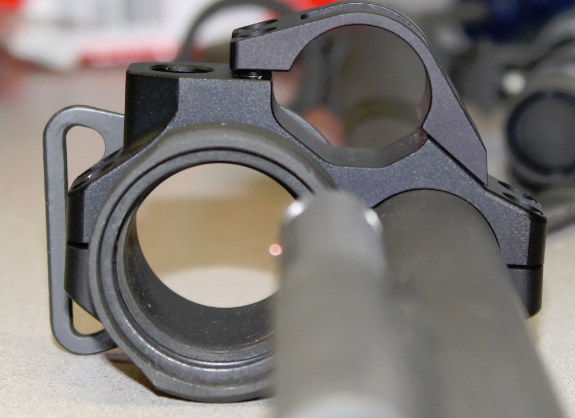 Superbly machined; fit and finish of the anodized mount is scrumptous ! I will be trying a variety of SureFire lights with the mount in the coming days and upload the photo's. Got my mount today, looks great and nicely packaged....now just need a M4 to put it on! Should have my stamp in another 6 weeks or so (14" in NFA jail). These are great. Glad to see the community getting a great product for a change. What needs to happen is getting one of these units into the hands of LAPD since they issue a lot of M4's out. Looked up LAPD today, and found several equipment lists with the M4 on it and several pictures with the Side-Armor full length rail setup. For a patrol vehicle quick deploy M4, slung M4, anything but large specialized optics or other railed equipment needs - I'd think light and nimble would be of benefit. Anyone have their armorer's email address? A few lights mounted to AVATactical's Benelli M4 mount.....just starting to tinker with it's potential. These are on a 14" M4 .......SideArmor full rail system plus the AVAT mount way up front. Then without the extra rails.....a Safariland thin LED light......doesn't get much smaller profile than this. Safariland light as seen by operator. QD attaches to AVATactical Picatinny rail.......remove it an put it in your shirt pocket or hang it on your duty belt. 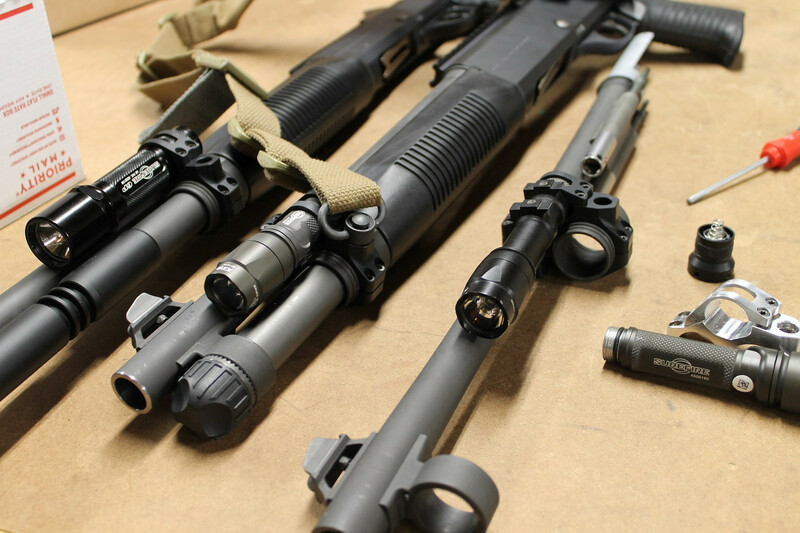 The standard SureFire X200-300 series easily mount to the AVATactical Picatinny rail. 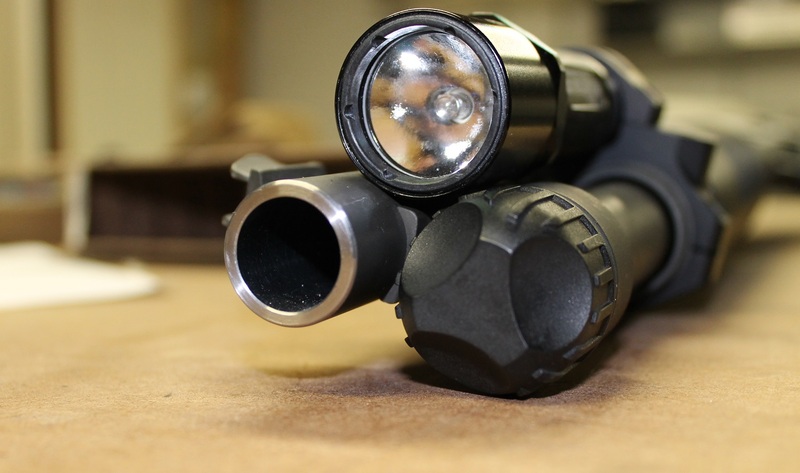 The X-300 ultra-500 lumen does with just a small amount of movement once secured to the rail.....slight modifications to the present design will expand the opportunity of the design to accommodate new iterations of these devices. This mount is machined with very close tolerances....you must be gentle starting screws with your fingertips on the torx tool to make sure there is no cross-threading; the head of the torx screws barely fit in holes of the mounts....not a complaint !.....just a heads up it's a nicely machined device that should be mounted with care. Curious...does addition/removal of the device alter zero with slugs any at all? Anyone confirm/deny this at 50+ yards with slug? Thank You Again, BenelliWerkes. Great pictures, feedback and information. I am presuming we are talking about removing the mount while leaving a laser aiming device in place and then remounting the entire mount? I haven't tested this, yet! However a few observations - The unimax series would have a laser on axis with the barrel, just ~11mm off to the one side. Given the close proximity there is very little difference between poa / poi, and I would set the zero to the outer limits. Due to how these two lines (poa/poi) converge from your firearm to your zero with very little gap and single axis adjustment (if at all), I would expect the dynamic of these changing from removing the mount to be minimal but it is yet untested. I believe the geometry involved will self center the mount and return your zero. I don't know how effectively yet, but it should be more than sufficient given the other factors. The Safariland LED is also an option.....using either side of the mount.